Books are available for purchase at the event for $10 cash or a small koha. the lives of the victims and their families. With up to 1 in 6 boys and 1 in 3 girls being victims before they turn 16 it is time to see how destructive and prevalent childhood sexual abuse is in our society and take a stand against it. 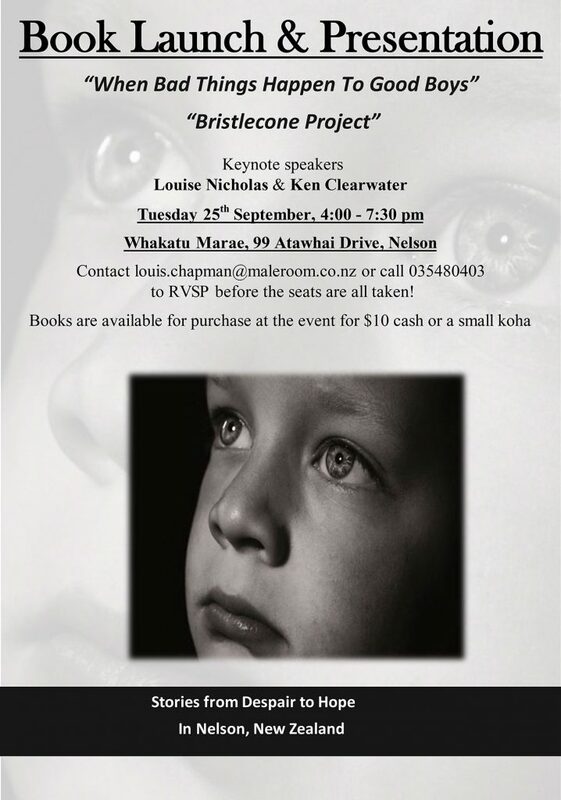 As well as the book we will be welcoming the National award winning Bristlecone Project to Nelson. This international project founded by Dr David Lisak in 2013 features a selection of eight still images from the exhibition of male survivors from Nelson alongside their stories of sexual abuse. The first hand multi-authored title will be launched on Tuesday the 25th September at the Whakatu Marae, 99 Atawhai Dr, Atawhai, with a Powhiri that is an open invite to the public to welcome this event from 4pm till 7:30pm. With key note speakers and sexual abuse survivor advocates Louise Nicholas and Ken Clearwater supporting the launch. When Bad Things Happen to Good Boys will be available for purchase at the event for $10 cash. Food and refreshments provided. We hope to see you there! Contact louis.chapman@maleroom.co.nz or call 035480403 to RVSP before the seats are all taken!